There is a reason why there have been countless books penned over the years about QUEEN and their legendary singer, Freddie Mercury - they were unquestionably one of the greatest and most universally beloved rock bands of all-time. However, most of these books can be neatly filed into one of three categories - a recounting of the band’s history, an examination of the singer’s life story, or a collection of photographs. 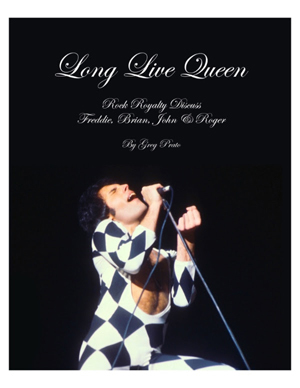 Long Live Queen: Rock Royalty Discuss Freddie, Brian, John & Roger is the first-ever book to be comprised solely of interviews conducted with renowned musicians, who discuss what they admire most about QUEEN, their favorite songs and albums, and other standout QUEEN-related memories (attending shows, meeting members, etc.) from throughout the years. The result is a book that uncovers facts, insight, and analysis, and adds a new spin on what truly makes QUEEN the champions of the world. Greg Prato is a Long Island, New York-based journalist, who has written for Rolling Stone, Classic Rock, and Vintage Guitar, and has authored such books as Shredders! : The Oral History Of Speed Guitar (And More), A Devil on One Shoulder and an Angel on the Other: The Story of Shannon Hoon and Blind Melon, and Grunge Is Dead: The Oral History of Seattle Rock Music. Long Live Queen is his 25th book overall. Long Live Queen: Rock Royalty Discuss Freddie, Brian, John & Roger is available as a paperback version [222 pages, $12.99], a Kindle download [$7.99], and is free for Kindle Unlimited members.